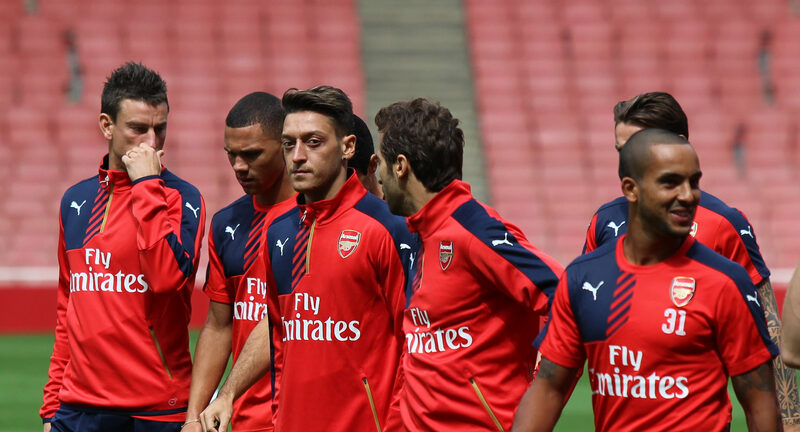 Arsenal members day 2015 – copyright JoshJdss, used under Creative Commons license. Yet to enjoy any kind of form this season, talk of the title has all but dissolved. Arsenal have a record of LWDWWL in the Premier League, and face a Leicester side unbeaten in the competition since April 30th. The mood has been brightened by a win over Spurs, but it’s back to business on a faltering season. Here are the five things Arsenal need from Saturday’s game. It goes without saying, but it almost doesn’t matter how. A good performance might be the elixir sought, but the three points are crucial. Grinding out the victory – in the way Chelsea are often praised for – would be just as effective. The three points would certainly offer belief looking towards the Olympiacos and Man Utd games, plus toppling the Premier League form team is hardly a pyschological springboard to be turning noses up at. A bore draw until the last minute of injury time, and a Chambers own-goalward shot deflecting the length of the pitch to win it? Well, it’d still be three points. As the rotated rotate again, we’ll be seeing the return of Cech, Bellerin, Koscielny, Monreal and Özil. Add to that likely starts for Sanchez, Ramsey and, in the absence of Coquelin and Cazorla, a possible central midfield duo (in any variation) of two of Arteta, Flamini and Ramsey. Flamini may get the nod after midweek heroics – emotional control and heart abound. If not, Arteta and Ramsey may go central with Oxlade-Chamberlain placed on the right. **Edit** – Cazorla will be available, so it’s a tricky choice! (Thanks @dartfordgooner). Whatever the variations, you’d imagine the team needs to exude stability and control for the win. A squad like ours will rotate, but it’s cohesion in spite of those changes which is required.A back line of Cech, Bellerin, Mertesacker, Koscielny and Monreal, is undoubtedly the strongest available to us. Yet defending as a team will put the spotlight on Sanchez and Chamberlain tracking back when required. It will also highlight the relationship between the two central midfielders and the defensive line, making the selection particularly interesting as well as integral to finding our team rhythm. Olivier Giroud works hard, but is considered to take criticism to heart and generally he fails to react with immediate positivity on the pitch. Getting on the scoresheet can only help the Frenchman lift himself from a malaise which seems to have entrenched him since being booed by France fans. It’s a clear contrast to Walcott, who seems in possession of endless reserves of mild ego, appearing ignorant of anything less than the full backing of everyone. Giroud could do with a shot of that, but more importantly a goal to lift his head and hopes. As one of only two regular forward options until Welbeck’s return, Giroud needs to keep up the likes of his first-half display against Spurs for the full time he’s on the pitch. Winning headers, making runs, and good interplay can result in a goal or two – or a winner – which may be the jolt he needs. Balance, goals and the victory are the main things any Gunner would want this weekend, but this theme of the last fortnight – thanks to the team’s poor disciplinary antics and…Jose Mourinho – is also essential. We need to work hard, play fair, and avoid being sucked into emotionally compromising situations. That is, not do anything which might result in a reckless dismissal. To be fair, meetings with Leicester are hardly tetchy and the last fixture yielded a not-unheard-of five yellows. Still, all games have the potential for flashpoints, and the manner of response is down to individual players in the heat of the moment. An opportunity to ensure tame tempers is one the team could do with taking. As much as pinning hopes on individual players is an exercise in ignoring team ethic, the combined £63 million spent on Mesut Özil and Alexis Sanchez inevitably means some expectation. In the past, a tie against Leicester may have provided an opportunity for the pair to masterfully strut their stuff. As it stands though, both German and Chilean have failed to ignite so far, and for either to do against this Leicester team could help the team regain its zeal. Sanchez certainly added some zip when introduced from the bench at White Hart Lane. And more of that might be a sign his busy Summer/rushed return has laid low the last of its effects. It’s not all on them of course. There’s the potential for improvements across the team, and nobody would begrudge a Chamberlain, Walcott, Ramsey, Koscielny, Cech or any other kind of master-class this week. Yet the main thing Arsenal need is a win against a very good team…and hopefully that (and some of the above) can lessen the sting of recent league events. All the skill Create a free website or blog at WordPress.com.